We have a new challenge at Ike's World starting today. 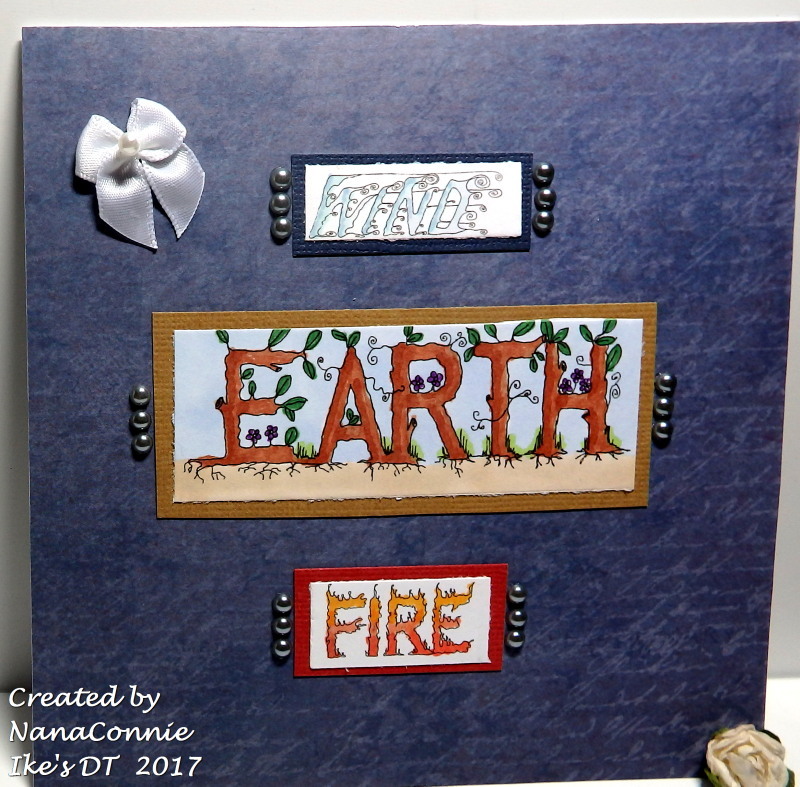 Our challenge is our usual "Anything Goes" but our optional twist this fortnight is to use a sentiment as a focus point on your card. I used Ike's delightful "Elements Word Art" to make mine. Let me tell you the back story for this card. I have a friend who is a great fan of "Earth, Wind & Fire." OK, I know some of you will shake your heads and say "Who???" but some of you will probably admit to remembering the Earth, Wind & Fire band from the 70s and 80s. This friend is throwing a party next month to celebrate memories of the band and their music, and she wanted something to use for party invitations. She asked me to make something and this is what I did. She loves it! Now we are figuring out how to make 20 of these without having to create each one individually. Ever since I started working on this card, the band and their music have been running through my mind. I did the coloring with my ProMarkers, then cut and matted them with rectangle dies from both QuicKutz and Spellbinders. 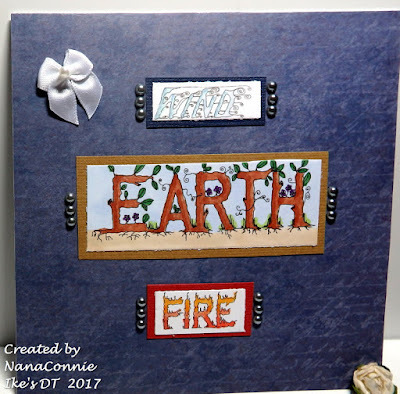 I used scraps of CS to cut the mats and a large scrap of dp from my stash for the background. For embellishment, I added the blue pearls and the little white bow. I love your invite - and yes, I remember them! This is fabulous, unfortunately I am old enough to remember Earth, Wind & Fire! I hope you figure out a good way to make 20 of them. Cool looking card and these will be great for invites! Love it! And yes, I loved Earth, Wind, and Fire too! I loved Earth Wind and Fire too! Your card is gorgeous Connie and would indeed make great invites. I bet this party will be one to be remembered. Great invitation. It is really perfect for the party. Thanks for joining us at the Di's digi designs challenge. What a fun party that will be and yes I do remember Earth,Wind & Fire. I, too, love what you came up with. Would it be possible to have the just the colored panels color copied and then just mat those copies? Might save a ton of coloring and time. Just a thought. Have a wonderful day. Very pretty card. Thank you for sharing with us at the PIP Challenges. You did a marvelous job on those invitations. She must be very pleased. Of course I remember Earth Wind and Fire....great band and music! Love how your invitation turned out! Thanks for sharing it with us at PIP Challenge this week! I listened to a little Earth, Wind and Fire today! Great invitation and will be curious to hear how you "mass produce" them. Thanks for entering into the PIP challenge this week.